Compare states to states. Compare regions to regions. Compare states within regions to other states within the same region. Compare people of the same age group, in any age group, men to men and women to women. Compare unemployed people to unemployed people, working folk to working folk. Compare city dwellers to city dwellers, country folk to country folk. Compare people with depression to other people with depression; people who are suicidal to other people who are suicidal; people who have a plan to other people who have a plan; people who have a past suicidal attempt to other people who have a past suicidal attempt, for God's sake! More Guns = More Suicides. Handguns in the home seem to raise the suicide risk more than rifles. The elevated risk is greatest for teenagers. People who live in households with guns are not more depressed than people who do not own guns. They are not more suicidal than people who do not own guns. They do not attempt suicide more often by any other means, hanging, poison, asphyxiation, jumping. But they shoot themselves more often than other people who attempt suicide. And when they do, they end up dead more often than other people who use other means. 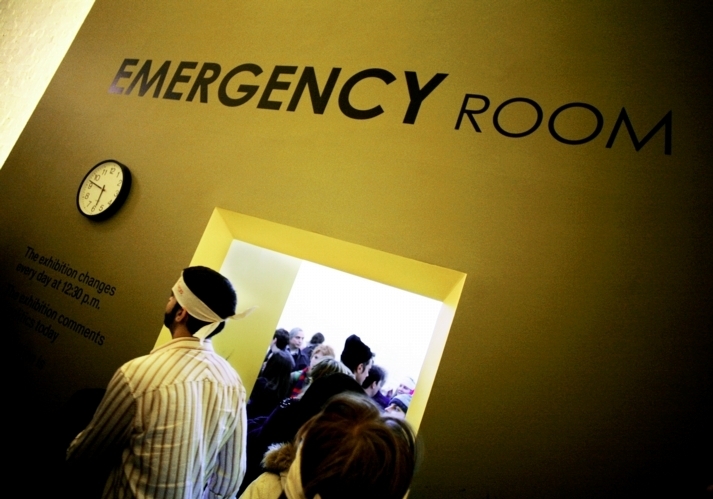 These numbers are from people who showed up in an emergency room in 2001. 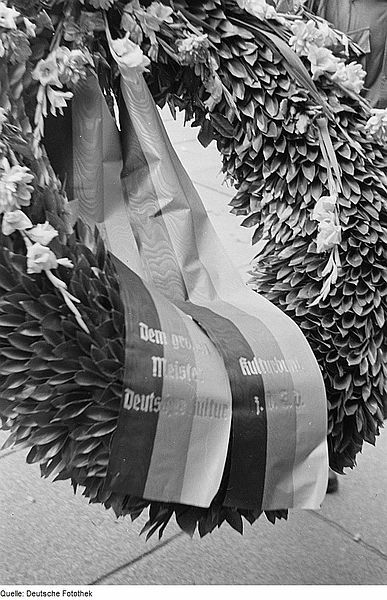 They represent how many people died who used the particular means to achieve that end. They underestimate lethality, because they do not include people who don't get to the emergency room, because they are already dead. If you count all the dead, all the numbers go up. Gunshot goes up to 90%. If you use a gun, your chances of survival and eventual recovery, like, wanting to live again, are about 10%. Of course, you may be severely and permanently injured. But that is beyond the scope of this post. If you take pills, your chances of survival rise. 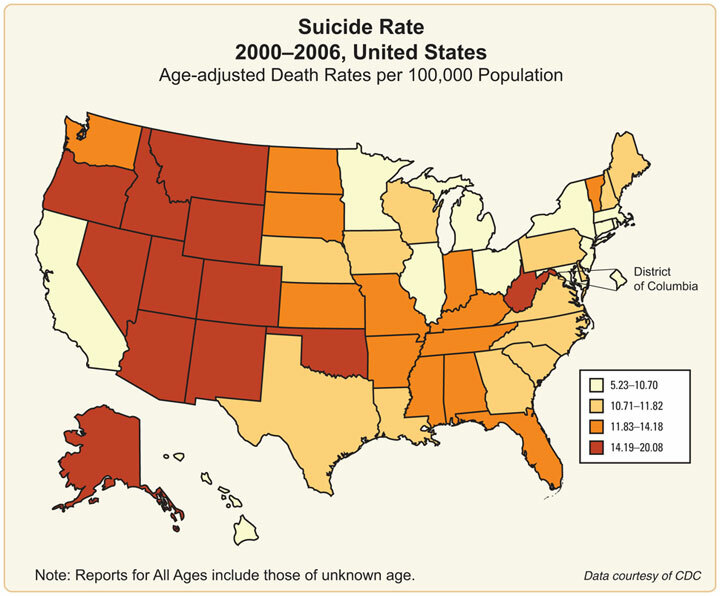 It is estimated that over 300,000 suicide attempts are made in the US every year. 90% of those who survive will not die of suicide. 70% of those who survive will never attempt again. Recovery is possible. The trick is to survive. Standing between the suicidal person and survival, standing between those who suffer from suicidal ideation and effective, evidence-based suicide prevention are several myths, things people think are true, but they are false. **How Seriously Did They Want to Die? One myth is that people who survive an attempt did not truly want to die. So maybe they chose an ineffective method, intending to survive? NO. 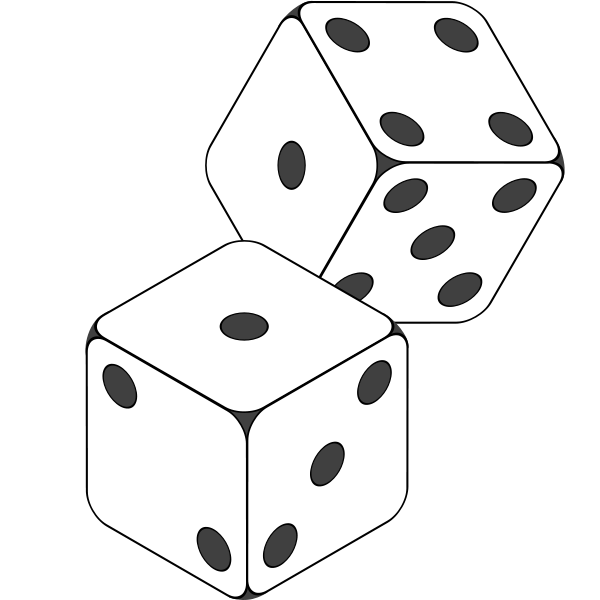 People choose a particular means for a variety of reasons. The chief among these is availability, but also perceived acceptability and familiarity. When survivors are interviewed, they often have inaccurate and inflated estimates about how lethal their means are. There is little relationship between the means chosen and the seriousness of intent. They survived usually because the method failed or they were discovered, in spite of their intention to die. Another myth is that you can't stop them. NO. No, no, no. And no. Suicide is prevented every day. 50,000,000 people are alive today who have or will at some point face a serious risk of suicide. 45,000,000 will survive. Lots more could. Suicide happens when pain exceeds resources for coping with pain. The basic strategy for reducing suicide is twofold, reduce pain and increase resources. Means reduction, taking steps to make particular methods harder to obtain, is a strategy that increases resources. A safer environment is a resource on the side of life. It can work even when not accompanied by mental health treatment or anything that addresses the reducing pain side of the equation. -- Though it might reduce pain to think that one's family or community or government cares enough to take real steps to prevent one's death. We have effective, evidence-based strategies for doing it. We have ideas that people have tried, and found to be successful in reducing suicide rates among those for whom they were implemented. This study was conducted in England and Wales among mental health service providers who implemented a range of strategies. Some of the strategies fell in the resources category; others addressed pain reduction. The ones most effective were a 24 hour/day crisis team, addressing co-morbid mental illness and substance abuse, and multidisciplinary reviews after a completed suicide. Specific therapies, including Cognitive Therapy and Dialectical Behavioral Therapy have been demonstrated to reduce suicide attempts. These would be pain reducers. Here is a whole list of strategies for suicide prevention. 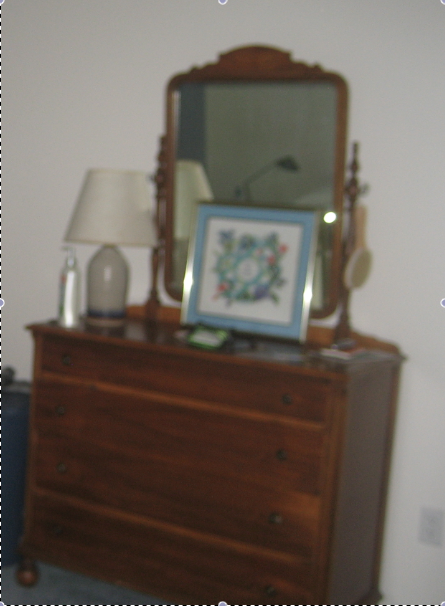 These are not accompanied by the research results, as the other items in this post are. 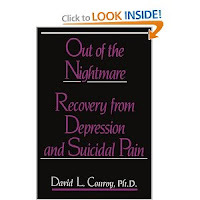 They come from David L. Conroy's book, Out of the Nightmare: Recovery from Depression and Suicidal Pain. There are many, many points of intervention. I found this study curious, because it compared people who attempted just once with people who made multiple attempts, and found that those who attempted just once had a higher level of intent at the time of the attempt than those who repeated. Most people who attempt suicide have some level of ambivalence. If there were another way to reduce the pain, they would not turn to suicide. Yet evidently, those with the least ambivalence, the greatest intent do not have higher rates of repeating. They do not necessarily persist until they complete a suicide. They can get better -- if they initially chose a method that allowed them to survive. **If One Means Is Not Available, Will They Substitute Another? Another myth is that it doesn't matter what method is available -- people who want to kill themselves will find a way. NO. Sometimes, but often, no. There is a reason why doctors ask what the plan is. Well, several reasons. 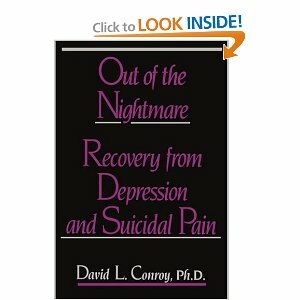 But one is -- if the person who is struggling with suicidal thoughts can be separated from the planned method, such as having somebody else store the medication or removing the gun from the house, then the risk for suicide goes down. The evidence from a multitude of studies and governmental efforts around the globe demonstrates that restricting means works. Inhaling coal gas, which included carbon monoxide, used to be the leading means of suicide in England. As carbon monoxide was removed from gas, suicide rates went down. Death by other means rose slightly, but not to compensate for the lives saved. The total number of suicides declined, meaning that those who might have used gas did not turn to other means, or they used less lethal means, and survived. There are loads of these examples. This one, regarding youth suicide by firearms, startled me. 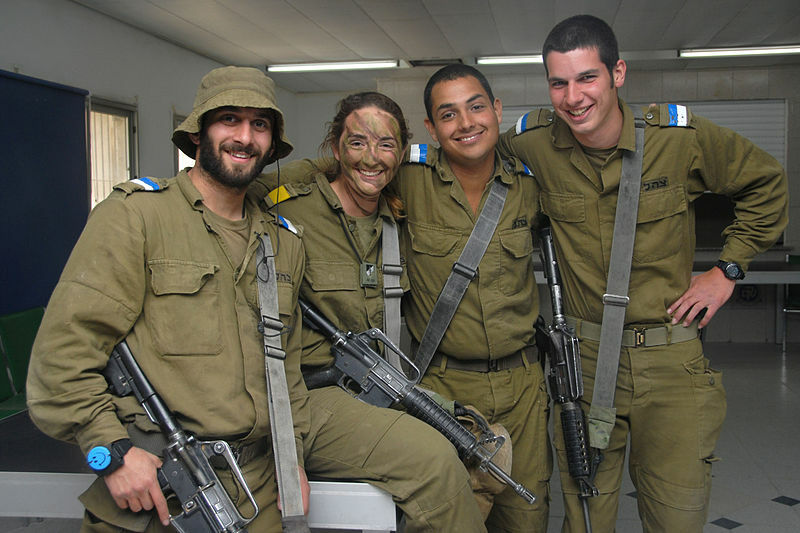 All young Israelis are required to serve in the Israeli Defense Force (IDF), providing in this case, a data base with no sampling errors. We are not sampling here. We are counting all young Israelis. 90% of all suicides by young Israelis in 2003-2005 were by firearms. Everybody has one. In 2006, the IDF changed its policy to forbid soldiers from taking their weapons off the base when they go home on weekend leave. In 2007-2008, the suicide rate in this age group plummeted by 40%. Most of this reduction was due to lives saved while on weekend passes. The weekday rate remained the same. Means reduction efforts are most successful when they target methods most frequently used, and most lethal. In the US, guns are the means in 47% of suicides, and have a lethality rate of 90%. Boys are more likely to use guns than girls, and consequently account for 80% of the deaths in this age group. Girls attempt suicide more often, but because they often use less lethal means, more often they survive. In a nation-wide survey, 2700 respondents were told that over 1000 people jumped to their deaths off the Golden Gate Bridge. They were asked whether these lives could have been saved if there were barriers to prevent jumping. Over a third believed that those prevented would have found other means to end their lives. Those most likely to believe that these suicides were inevitable, could not be prevented, were cigarette smokers and gun owners. I received a message from a reader when I started this series, expressing the reader's appreciation for my addressing the topic. She told of a friend who was at risk for suicide, and had begged her family to remove the gun from the house. They did not. She used it to commit suicide, and she is now dead. I don't know the family. I can't imagine that they didn't care. I can only imagine that they did not believe her, that they thought it would make no difference to remove the gun. The evidence of the Israeli Defense Force demonstrates that probably they were wrong. You may not believe something. But it still could be true. Means reduction works not only by reducing lethality of attempts, but also by addressing impulsivity. People don't spend as much time planning a suicide as you might think, especially young people, people who experience a significant loss of relationship, and people who abuse alcohol. A study in Houston of people aged 13-34 who nearly died from their attempt asked, How long had you planned your attempt? 24% said, Less than five minutes. Less than five minutes. 24% said, Less than five minutes. 71% thought about it for an hour or less. Only 13% planned it for more than a day. Substance abuse and depression are frequent underlying risk factors for suicide. But the impulse itself can be extremely short-lived. Time is the suicide preventer's best friend. If the person has to go get the means, the impulse may pass, the person may sober up, the friend may call, something, anything might happen to relieve the distress and prevent the action. increases the risk of suicide, especially by young people. and eleven attempted or completed suicides. Pay attention: This refers to guns discharged in or around the gun owner's home. So there are the odds, one chance out of twenty-three that a weapon stored in the home will be used in self-defense, twenty-two chances that an unintended tragedy will be the result. That's it. That's what I've got.